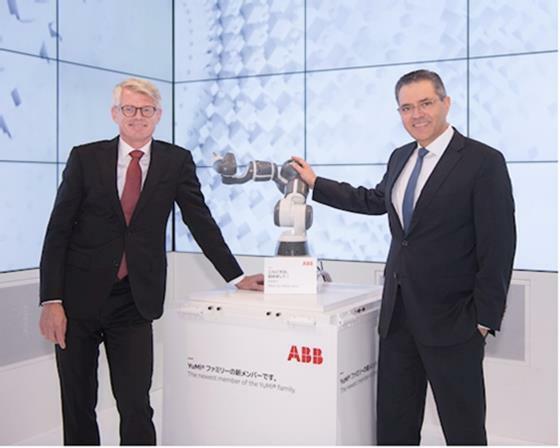 ABB is previewing its newest collaborative robot, now with a single arm, at the International Robotics Exhibition (iREX) 2017 in Tokyo. As their name suggests, collaborative robots are designed to work alongside humans on the factory floor to raise productivity and support the transition to mass customization. The robot will be officially launched in 2018. Like YuMi, a small-parts assembly robot introduced in 2015, the new robot has a payload of 500 grams and, thanks to its compactness, is easily integrated into existing assembly lines, increasing productivity. The new robot also features lead-through programming, eliminating the need for specialized training for operators. “The success of YuMi has exceeded expectations; it was originally designed for small-parts assembly, but it has turned out to be exceptionally versatile – it can solve a Rubik’s Cube, make sushi, wrap gifts and conduct an orchestra. Based on YuMi’s enormous success, we fully expect our new single-arm robot to be equally well-received, especially since it was developed at the request of customers,” said Sami Atiya, President of ABB’s Robotics and Motion division. ABB is exhibiting at iREX 2017 from November 29 to December 2, in the East Hall, Booth IR3-56.